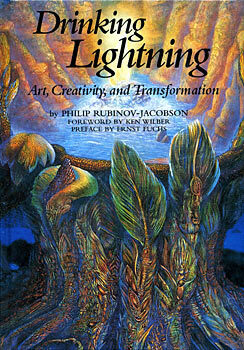 Drinking Lightning is a fascinating, personal exploration of the relationship between art, creativity, and spirituality. Philip Ruvinov-Jacobson is both a writer and an artist--a bridge-builder between many different worlds. Here, he describes his encounters with a number of remarkable creative mystics and artist who, like him, have sought to explore the furthest boundaries of human experience--entering transpersonal domains associated with healing visions and archetypal dreams. During the early 1970s, Rubinov-Jacobson studied painting with the renowned artist Ernst Fuchs--internationally acknowledged as the founder of Viennese Fantastic Realism--and was introduced to a group of creative thinkers whom Fuchs referred to as 'a Secret Lodge of Visionary Artists'. Rubinov-Jacobson later worked with other spiritual teachers representing various wisdom traditions from both East and West. Collectively, these visionary encounters would provide a basis for the exploration of art and creativity--opening a path which resonated with the writer's deepest intuitions, while also offering a revelatory and unifying vision of human spirituality. Philip Rubinov-Jacobson provides us here with a provocative overview of the problems, passions, and pathways of the creative process, synthesizing insights from his own life experience with an enthralling and sometimes irreverent analysis of the nature of the artistic temperatment, the role of the artist within the community, and the relationship of art to spirituality. Passionately written--combining wisdom and inspiration with biting wit and humor--Drinking Lightning invites us to explore dimensions of human creativity which have long been neglected or forgotten. It is a book which helps to enlarge our understanding and belief in our own inherent creative potentials, providing us with an inspired sense of spiritual direction in both art and life. "This is a wonderful book, ripe with the wisdom of an artist in whom the creative fire is alive, touched by the Gods and Goddesses of a realm that the conventional mind too often fails to see, enraptured by a vision of a beauty too painful to pronounce. art, as the eye of spirit, is the royal road to your own soul, and this book is nothing less than a road map for that extraordinary adventure." "Philip Rubinov-Jacobson points us to a door to transcendence. His story opens vistas to the greater possibility"
""Drinking Lightning is a multifaceted gem which is both an autobiography and a heartfelt philosophical reflection--reminding us that creativity and spirituality are One." Philip Rubinov-Jacobson was born in Rochester, New York. He holds Masters degrees in painting, printmaking, and sculpture, as well as degrees in psychology, philosophy, and comparative religion, and has also exhibited internationlly as an artist. In 1995, assisted by a hand-picked staff, he founded and directed the new School of Continuing Education at Naropa University in Boulder, Colorado, and served there as dean from 1991 to 1997. He currently works as an artist, writer, lecturer, and international consultant to a number of holistic centers, and is collaborating with Ernst Fuchs to establish the first International Museum and Academy of Visionary Art in America.